Once youngsters have become interested and passionate about baseball, training can begin in earnest. This is particularly true of young pitchers, who will likely want to try to add pitches to their repertoire and attempt to throw with more velocity as they gain experience. However, pitching requires an unnatural arm motion. Young people are vulnerable to injury and that's why most youth baseball leagues employ strict pitch counts. Youngsters can do certain exercises to strengthen the pitching arm, help build velocity and avoid injury. Throw the ball with a partner for about 10 to 15 minutes every day. While excessive pitching off the mound can cause arm strain, throwing the ball or playing catch on level ground for a brief period will build strength. Concentrate on throwing with your entire body, making sure to follow through and getting full extension as you throw. Do pushups to build strength in your arms, shoulders and upper body. On the Pitching Tips website, instructor Steven Ellis recommends pushups for pitchers of all ages. Do three sets of 15 to 25 pushups, taking a two-minute break between sets. Pushups build strength the arms, chest and the particularly delicate muscles that form the rotator cuff. Perform arm circles to build strength in your shoulder. Young pitchers benefit from doing forward and backward arm circles. Stand in the middle of the room -- where your hands won't reach the wall -- and extend your arms outward. Rotate each arm forward 10 times in small circles. Take a 30-second break, then make small circles in a backwards motion. Take a one-minute break and repeat the drill. Face a wall, put your hands on it and lean against the wall with your arms bent. Your weight should be resting on your hands. Push out until your elbows are straight. Return to the starting position. These are called wall pushups and can help build strength in your shoulders. Increased strength in the shoulder area will make it easier to pitch over the course of a season. Be sure to stretch before workouts, practices and games. In an article for Pitching Tips, former Chicago Cubs pitching pro Steven Ellis notes that stretching your shoulder and arm muscles can help prevent injuries and help prepare your body for movements you'll make when pitching. 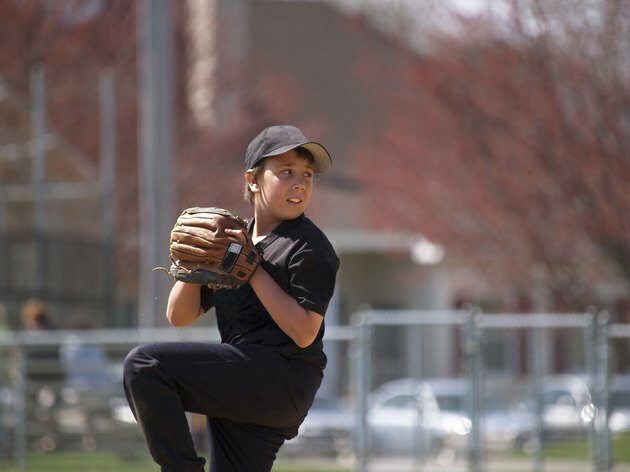 Consult your doctor before beginning any new exercise regimen, and discuss the impact of pitching on a young player's arm and other body parts.